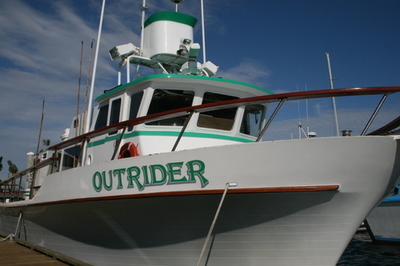 The Outrider is a 50’ Delta of fiberglass construction that was built in 1976. The boat features the latest in communications and navigation, as well as a side scan sonar in the captain’s wheelhouse. There’s ample deck space all around with plenty of space at the rail. The Outrider features two large capacity bait tanks for the best live baits available. It has recently been upgraded with a brand new RSW to keep your catch exceptionally fresh and will be utilized on every trip. The bunk room is air conditioned and has 11 spacious, comfortably padded bunks. Clean pillow cases and blankets are provided for every trip. The two heads feature running water with the availability to take a warm shower if needed. Our galley is fully stocked and ready to serve hot meals, snacks, and cold beverages. The galley also includes a large flat screen TV with satellite service and Blue-ray player for entertainment.